Done For You sounds great, doesn't it. You pay a chunk of money, probably well into five figures, and for that hefty investment someone else sets up your entire business. They probably choose the product for you. They certainly set up the funnel. Web pages. Copywriting. Buy buttons. Fulfillment. And, of course, it's easiest if the product is a digital download or physical good. A thing someone else has made. That way you don't have to do anything at all. Done For You is different from Business In a Box...the biz in a box "opportunities" describe a demand for a specific product or service by a niche out there while leaving the selling to you. Done For You does the selling, too. I am not saying "Never subcontract anything out." I sub out projects all the time. But they are things I shouldn't be doing...though I know how to do them. For example, I can create a header (the banner across the top of a website). I can do a decent job, and the initial version on a new website I'm putting together will likely be mine. But are there graphic artists available who are much more proficient at art programs, and have better design ideas, than I? Certainly! However, my point here is that I know how to do the job. I understand what I am subcontracting. So there is a point of ridiculousness I'd like to illuminate here. 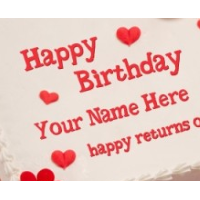 For instance, maybe you don't know how to bake a birthday cake. So is Jason saying not to buy a Done For You birthday cake from the supermarket because you don't know how to make one yourself? Let's all have a good giggle about that one. Here's the dividing line: Do I depend on this? That's the question to answer. Do you depend on this? Nobody depends on a birthday cake. Not to live. No one is going to suffer or die if a birthday cake is not present. Except perhaps the cake baker (Ah ha! Now we're getting to the core of the matter). Do you depend on your business? As a vital source of income? Yes? Then don't you think you'd better know something about it? 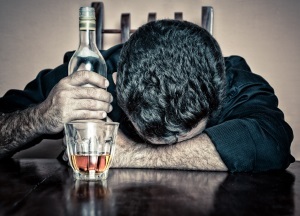 People who jump at Done For You businesses reveal underlying problems about themselves. These include lack of commitment, lack of confidence, and possibly even a learned helplessness that nothing is ever going to get better if they have direct control of it. At one point I set up an emergency donation page with a custom header, fresh copy, and donation button in about an hour. The recipient was amazed: he told me I was so talented and asked how I had been able to complete these tasks so quickly. I shook my head. This guy had been in the online marketing field for literally years longer than I had--twice as long, actually--and had not learned these essential basic skills. What Does This Example Show You About Done For You? With Done For You, you never learn how to create a profitable business. You never learn how to choose a winning product or service. You never learn how to set up an effective sales funnel. You never learn how to sell. You never develop any expertise or skill whatsoever. You never learn how to do anything. If you think that's okay, keep doing what you're doing. But don't shriek when the DFY (Done-For-You) biz dries up or fizzles in the first place, and you realize you don't have any skills...haven't learned anything...and are completely unable to make the next move on your own. What Product Should I Make? What product should I make? I'm frequently asked this question, whether privately, on forums, or expert platforms. Those asking usually but not always have some technical expertise. They can make something. But they're just not sure what. Know why they have this problem? They're not close enough to their target market. They're thinking too much about themselves. What needs to be created is not in them. It's in their target market. And to find out what that is, you have to get real close and listen to what that niche is saying. Creating a better mousetrap is not okay. Do not work in isolation. Do not rush out and make a product as fast as you can because you feel you must. Go speak with your target customers. Hear what they have to say. Yes, this will slow your time to market; however, you will end up with a product people actually want rather than a dud. My first "product" was a 30-minute phone sales training call. It was later expanded into a 3-hour conversation and a membership site format. Now it's a four-figure program with two supporting membership sites. I did not run out and create it as soon as I began interacting with the marketplace in the fall of 2011. Instead, I first interacted with that audience for three full months. I answered forum questions that demonstrated I knew my topic. In fact, one of the big issues was how to package what I knew into a bite-sized format! Operations management, coypwriting and sales training were all competency areas, and I did not know which one would take off. If I had pushed out a product as soon as possible in 2011, it very likely would have been off the mark. 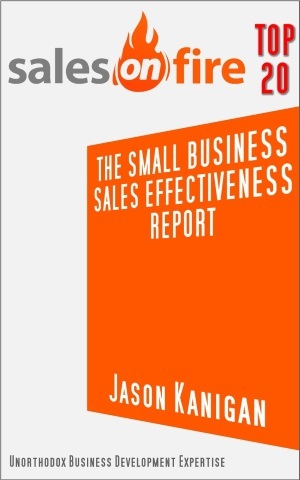 What actually happened is by January 2012 I was recognized as an expert in the sales training field by this marketplace, and there was pent-up demand for something from me. By simply casually reviewing the interactions I had had with my customer base over the past three months, it was simple to pick out two facts: only one other phone sales trainer was selling his services there, and nobody else was talking about the consultative approach. There was a need for someone to teach a straightforward, friendly, ethical way to start great sales conversations by phone. If I had not spent the time interacting with my marketplace beforehand, I would have gone off the trail and created something nobody wanted. Talking with my target market allowed me to niche down. It gave me the boundaries to package part of what I knew into something they wanted. It also let them "try before you buy"--they got to see my expertise before having to make the decision about whether to invest in it or not. Rush in and you'll get neither of these vital results. Now the good news is you don't have to spend three months working with your target niche before coming up with something profitable. I had copywriting work during those months that allowed me to take my time. But you may only have a few weeks, and that's all right. You just need to talk to people. Not try to sell them anything. Just talk to them. In my last post, I discussed how you can conduct information interviews with decision makers in your chosen niche. In these interviews, you will learn what key problems they have and how critical it is for your potential customers to get them solved. Just call, say you're doing some research, and set up a time for a 15-to-20-minute interview. You'll be amazed how easy these are to get, and how informative they are. You may find you were headed down the wrong path and a much more profitable idea was hidden from view. When one decision maker in a niche tells you about a problem, you can be sure many decision makers in that niche are experiencing the same issue. When two or more decision makers in a niche share the same difficulty with you, especially when using the same wording, you have a winner. Then you have a strong answer to 'What product should I make?' and can go create the solution. But hear it from your target market first. Go to magazines.com and see if there are magazines for your niche. If there is even one title for your topic, you know there is a market. Now read the headlines. What are they talking about? What problems are they highlighting, that they're using as hooks to encourage readers to open to Page Whatever to find the solution for? Head over to Amazon and search for books in your niche. Now look at the reviews. Read them. You'll run across things like "I bought this book because..." and "It really helped me to...". These sentences tell you exactly what was going on in your target customer's head. A bunch of customers are saying the same thing? Great! Now can you fix that problem? Maybe you should buy the book, if there are several reviews discussing a problem and solution you can have an effect on. But nothing takes the place of genuine conversations with real members of your target market. Don't chicken out. You could be missing a fortune in exchange for a simple task if you do. ADVANCED PRICING IDEA: look for problems the size of which lets you set a price at 5-10% of that value...and also allows you to hit your monthly revenue target with a reasonable number of sales. If you're interested in a framework or roadmap that builds a business for you around what I've been sharing here, check out Jeff Steinmann's How To Quit Working. ...when you want to make sales but don't know your new niche. then you badly need to do some information interviews. The fact is, this is your target market. And hearing what they want and value in their own words is critical. Nothing else is more important. Not what you believe their desires and values are. Not what you hope or think they will be. When we talk about pain points, this is what we mean. These words. These phrases. 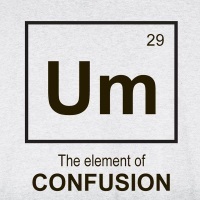 This jargon. This terminology. When you repeat these pain points to members of your target market, they will listen. These terms will resonate with them and that will give you instant credibility. When we talk about finding the work role you truly enjoy, you need to know several things. What people who do that job actually do all day. What they like. What they don't like. How different the same job is at different companies with different cultures. How those companies hire. 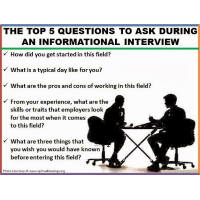 These critical knowledge points and more are readily available in information interviews. People are cooperative and like to show off what they know (I'm doing it right now!). So let them. This isn't hard. Nearly everyone you call will be open to at least talking with you on the phone for a few minutes. You may have to schedule a time to call back or meet in person later, and that's fine. So say there's a job you want to do, you think, and you'd like to find out more about it. The funny thing is, the same job done at different companies can be totally different experiences because of cultures. So it's best to talk to three or four people doing that job at separate firms to get perspective. To find these people is not difficult. You can use LinkedIn. Or you can use a simple method called the Little Unsure technique, where you ask the receptionist, "Hi, I'm not sure who I should speak with...I'm looking for the person who does [whatever role it is]. But again, I'm not sure who that would be there..." and trail off. This method is very effective. You may get voicemail. 3/4 times the person you're calling won't be available to take your call. Don't take it personally. Leave a quick message or call back later now that you have the name. For messages or live answers, say you are doing some research, are interested in the role they have and are wondering if it's right for you. If they could speak with you for about 15 minutes, it would be very helpful. If now's not a good time, when would work? Have your questions ready. They may want to go ahead right now. I have had employees get time for such interviews in person approved by their boss...again, people want to be cooperative. Once in awhile you may find someone who is "too busy". Simply move on. No big deal. That person is probably not a fit anyway. The higher you go in larger organizations, the nicer the people you'll find. How did the leaders in most organizations get there? The Sales career path. They know all about cold calling. They appreciate it. Nearly all of the success factors here are getting past your fears. These fears are simply not valid. They don't hold true in the real world. Nearly everyone is flattered someone would ask their opinion. Go find out whether this job is really something you want. And you'll also find out what kind of different corporate cultures exist...which will play a big part in your job selection, if you're smart. Don't be in "I'll Take Anything" mode. Start sorting. Have an interview plan. What is the purpose of the interview? Don't be wishy-washy. Your two questions today could have used a lot more detail. Here's an example of several information interviews with fellow sales professionals. Write out your questions beforehand. 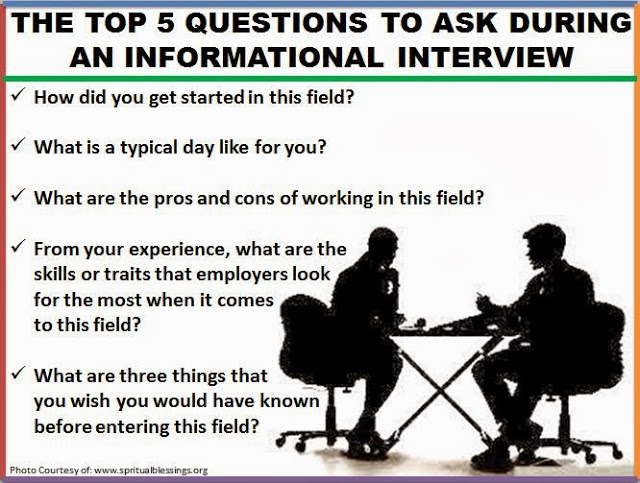 Of course one or two new questions will occur to you while conducting the interview; ask them, too. But have your base set up. Think about your request from their perspective: WHY would they want to participate? Yes, people want to be cooperative and helpful. But No, they do not want to create content for you (for example, I am asked to be interviewed all the time by people who are compiling such expert interviews to then SELL them...why on earth should I give them content so they can make money with it?!). So be clear about your purpose. You really must be looking for expertise, not digging for a job. Fake purpose will be seen through immediately and it will hurt your reputation. Collecting a series of these interviews online around a specific topic is a great differentiating factor for job hunting, however. This is positioning. Information interviews to uncover pain points are very similar. Use the Little Unsure technique to reach the decision maker. Tell them you're doing some research. Then have a straightforward conversation about your topic. Have they considered buying or have they bought what you offer? How did they go about that? For both job hunting and finding pain points, realize you must do several of these to get correlation. One or two is not enough. However, the activity level and payoff for booking and completing say a half-dozen information interviews is very powerful. You will feel incredibly confident because you finally understand your market.